BuildBlock Building Systems was formed in 2004 by founder and CEO Mike Garrett. Mike had been a top distributor for two other major ICF companies and spent more than 12 years in ICF construction and distribution and another 15 years in residential and small commercial construction. He pioneered the use of ICFs in Oklahoma. BuildBlock ICF forms were created to overcome many of the problems and costs encountered with other ICF forms. Extensive experience building custom homes and small commercial structures over the past 15 years combined with his 12-year involvement in ICF distribution and construction helped lay a solid foundation to create one of the most installer friendly ICF on the market today. a strong web that had 8 inch spaced web cross bars so a block could be cut in half allowing each half block to maintain the same strength both top and bottom eliminating the need for half height specialty blocks. The BuildBlock ICF web also uses saddles in the center portion of each web for setting steel to eliminate obstruction of concrete flow during the pouring process. Longer corners and 45-degree corner forms with full-width connection fingers eliminate corners from pulling away from wall sections during the pouring process as well. Other forms often require additional accessories to obtain what the BuildBlock form does by itself. The form connections are the full width of the foam thickness, unlike other forms that often must be glued to prevent them floating or coming apart, totally eliminated this need in most circumstances saving additional foam expense and labor. BuildBlock Forms were designed on a 6-inch web spacing making them one of the strongest forms on the marketing and providing additional attachment points for bracing and finishes. All BuildBlock forms are fully reversible eliminating the need for left and right corners and allowing much faster installation times. 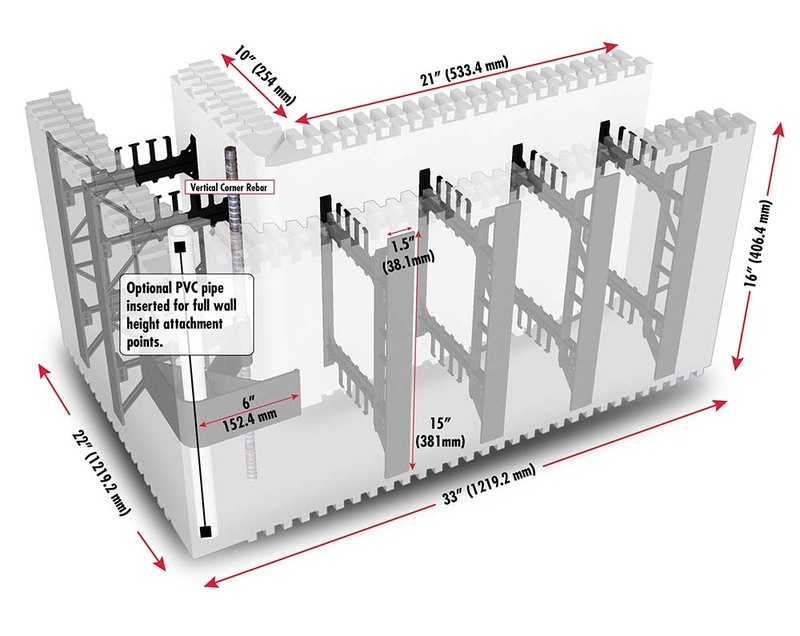 One-inch vertical cut lines with a one-inch repeating cut pattern eliminating foam waste in every cut (allowing waste of 1% or less) giving the designer and installer the most versatile value-added ICF form on the market today. BuildBlock strives to manufacture the finest, most value-oriented form in the marketplace, building one of the strongest distribution and manufacturing companies along the way. BuildBlock introduced the industry’s first online ordering system allowing customers to order products at their convenience, while also developing a unique master distributor program with protected territories. Each year BuildBlock increases its manufacturing locations. Currently there fifteen locations in North America. More locations provide shorter shipping distances and lower the delivered form costs to our distributors and customers. It further increased its distribution with foreign licensing of its products around the world and opened its first foreign facility in Egypt in 2012 making BuildBlock truly an international form company. BuildBlock has added western Canada and Mexico facilities since then and continues to expand. BuildBlock has additional licensees around the world including Cyprus and the Philippines. BuildBlock has continued to evolve its product line including versatile and very affordable BuildDeck floor and roofing system, BuildLock Knockdown 4-12+ inch products, GlobalBlock the first fully reversible all foam ICF, and the newest addition BuildRadius, the first true radius form on the market. Additional ICF accessories such as BuildBrace an ICF bracing and alignment system, BuildCrete Stucco & Plaster finishes, ThermalSert Insulation Inserts, and BuildClip an optional reinforcing clip strengthening cut blocks as they’re integrated into flooring systems are added to solve needs in the market today.